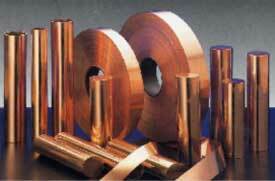 With a wide range of uses copper strip is ordered when electrical contacts, connection, windings, switches, terminals, sockets, relays, transformers, cable, fuses, switchgear, circuit breakers, conduit, wire and cable wrap, circuit boards, fuses, cell phones, computer circutry, automobile, train, bus, plane, ship, boat, snowmobile, jet skis, helicopter, truck and motorcycle electrical components are needed for manufacturing purposes. This metal form is also used in the creation of hardware, gaskets, radiator, roofing, flashing, cosmetic, architectural, trophy, strip lighting, furniture, coil, stereo, audio, weatherproofing, molding, airplane and stained glass products. Copper strip is also used for stamping, electrical, marine, automotive, naval, houseware, hardware, fasteners, roofing, gutters, downspouts and copper coining operations. Available Widths: Full 12" or 24" mill widths or custom slit from .125" and above at a tolerance of (+/- .005") Camber maximum .500" in any 72" portion. Available Surface Condition: Mill/ polishing and plating quality/ Tin Plated/ Mirror/ Satin/ Antique/ Custom Colors/ Baked Enamel/ PVC and non-adhesive protective covered.